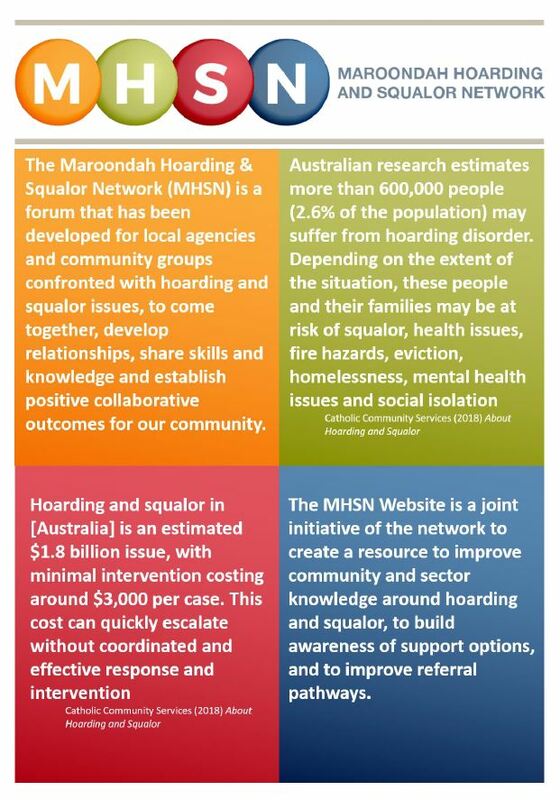 The Maroondah Hoarding & Squalor Network (MHSN) is a forum that has been developed for local agencies and community groups confronted with hoarding and squalor issues, to come together, develop relationships, share skills and knowledge and establish positive collaborative outcomes for our community. The network is underpinned by a ‘No Wrong Doors’ approach in order to assist each other and our community through complex issues. This approach ensures that all organisations are committed to facilitating a referral to a more appropriate agency in the event that they believe they are not the best agency to assist the situation. identify opportunities to support our local community with hoarding and squalor issues. The Network is open to Emergency Service agencies, community groups, housing and health care services, Local and State Government Departments, the education sector and any other agency that experiences hoarding and/or squalor as part of their routine business. Private organisations will be invited to attend at the discretion of the network. Membership meetings are hosted by Maroondah City Council on a quarterly basis.